← Frank and his football. Football by the Electric Light! The story that Rhyl was the first place in the world to hold a football match under floodlights has always seemed rather fanciful. A little research reveals that Rhyl teams were probably the first teams in Wales to play under floodlights, although the match was held in Abergele. In his book “Rhyl, the Town and its People”, J.W. 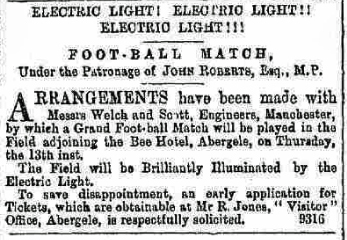 Jones says “1879 – Thomas Edison provided floodlighting for the World’s first floodlit football match at Rhyl.” However, this was not the case. “”Football Match by Electric Light – On Thursday evening a football match was played in a field on Wellington Road, by the aid of the electric light, the competitors being the Grosvenor and another club going under the cognomen of the “Skull and Crossbones” football kickers. Every precaution had been made by the speculators for a rich harvest of gate money by an effectual barricade of the premises; but we believe that they were as much disappointed in that respect as we were at the entertainment offered for the sixpence and shillings paid for witnessing it. Anything more inconceivably ridiculous we could not possibly imagine than the spectacle of a lot of young men on an evidently purposeless exhibition of one of our best national games. However, it was announced to be a drawn game, and there the beribbed guernseys and the skull and crossbones ditto sent up a hearty cheer, the glaring light was put out, and we joined the disappointed throng in groping our way home determined to apply our sixpences to better use in future”. Newport v Cardiff on 17 December 1878, played under rugby rules, would appear to be the first floodlit football game in Wales.